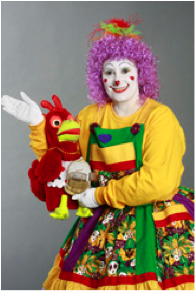 Dee Dee the Clown has been performing and delighting children of all ages for over 15 years. She is the co-owner of Laughter Without Borders Ltd established 2005. – Canadian Director of the World Clown Association since 2007. – Dee Dee may provide stage shows for fairs or larger events. Face Painting, Balloon Sculpting, Glitter Tattoos & Nail Art. – Dee Dee has trained at the World’s Largest Clown School from 2004-2009 by Ringling Brothers and other professionals from around the World. – Dee Dee was a Guest Performer for The Ringling Brothers and Barnum and Bailey Circus in Anaheim California.